These are some of what I've accomplished in the last two days. The workshop is absolutely fabulous, and I've definitely gotten my money's worth. I can hardly wait to get home and get my poles and dye pots going! After a hard day of driving, I'm happily ensconced at Suzie Liles' home in Eugene -- that's Suzie on the right -- with Jan Myers-Newbury. 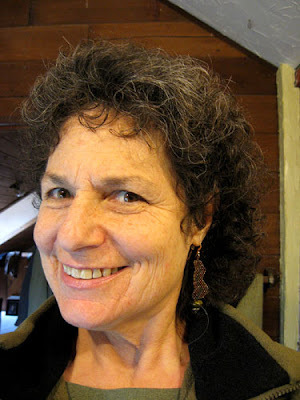 Suzie is a co-owner of the Eugene Textile Center where our workshop will be held. 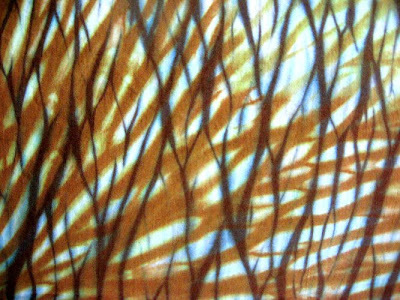 She made a delicious meatloaf for supper, and now we're talking blogs and stuff, drinking wine, and giving Jan a hard time because she's a techno-ludite, still showing slides for her shibori presentations! It's raining here in Oregon but that won't hamper our workshop. I'll post photos tomorrow! Finally decided to give myself a holiday from art making for a week or two, until I'm settled into the new studio. 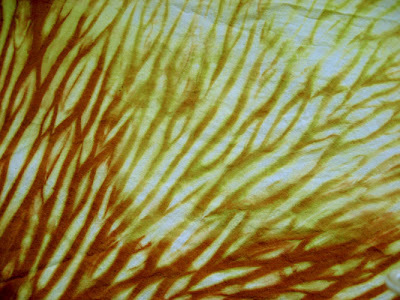 Actually, I'll be shibori dyeing this coming Sunday through Tuesday. But I'm taking a little time off the weekly quilts, and a few days off from collaging, the latter largely because I'll be out of town. Just about everything is moved, except the biggest stuff -- my oak sideboard, my mattress, a couple of bookshelves, my couch and ottoman, two studio tables -- and several boxes of remaining small stuff and a few odds and ends. As I made all these trips to Fortuna this week, I came to realize that I am really glad to be leaving Eureka and moving a few miles south. Fortuna's population is about 12,000, whereas Eureka's is about 30,000, and with the addition of Arcata and Humboldt State University, the greater Humboldt Bay area has about 50,000. Still mighty small compared with where most of you probably live, but the older I get the smaller the town I want to live in. Fortuna is really beautiful, the town surrounded by foothills, with lots of trees and beautiful vistas, and right on the banks of the Eel River. Fortuna is also warmer than Eureka because it's a few miles farther inland. Oftentimes in summertime, Fortuna will be gorgeous, warm and sunny, while Eureka will be cold, fogged in and dreary. So I'm a happy camper. I'm off on my holiday to Eugene, Oregon tomorrow morning (Saturday). 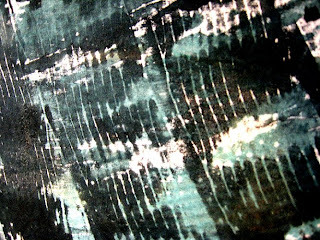 I'll upload photos of the shibori workshop enroute if I can, or next week when I return. Part of the soundtrack of my life when I was quite young, was Rhapsody In Blue, George Gershwin's gorgeous piano composition from the 1920s. No, I'm not THAT old, but my father was into jazz somewhat in the 1950s, and we had a 33 rpm recording by pianist Oscar Levant that was played alot in the house. Lucky me -- I hadn't remembered even this until right now! My dad was also into bossa nova, the Brazilian music popularized by Antonio Carlos Jobim and Joao Gilberto. Wouldn't you know that all the CDs I carry in my car these days are jazz, specifically Jobim himself or other jazz musicians' covers of his work. So Brazilian jazz is the soundtrack in my head now! Anyway, back to the matter at hand ~ this quilt is Rhapsody In Blue ~ 13/52.2009. Between packing and making trips down to Fortuna (two planned for today, two tomorrow, two on Friday), I'm still quilting! And as this is the 13th weekly quilt this year, we're one quarter the way through this year already. Kind of hard to believe. I don't think I ever experienced a winter passing quite as quickly as this one did! 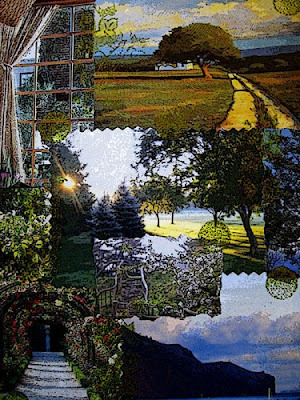 Vistas are a frequent theme in my daily collages ~ views into the future, images of heaven perhaps, paths that take me from here and now to another time and place. Another day on my journey, today. I am fired up with energy, moving the tide of this sea change forward. I moved all my dyeing supplies down to my new studio last Friday, except for some thickened fiber reactive dyes that I've been meaning to use up. I finally did that, yesterday. Note to folks who wonder how long mixed dyes will last before losing their oomph: these dyes were mixed with sodium alginate to thicken, probably two to three months ago. Turquoise was the only color that lightened with age and looks quite a bit different in the final product than it did in the jar. The fabrics were soaked/steeped in soda ash and dried, prior to dyeing yesterday. Except for the first piece above, these are all fairly good sized pieces of fabric. And most are a linen blend, with either cotton or rayon. 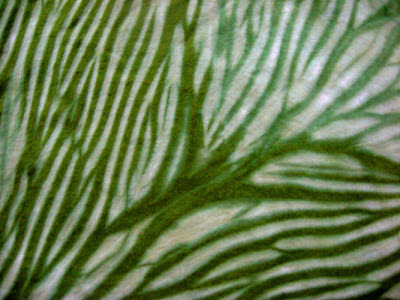 I love dyeing that stuff -- the colors are far more brilliant than on cotton alone. So it's just about "pedal to the metal" time for me, moving-wise. 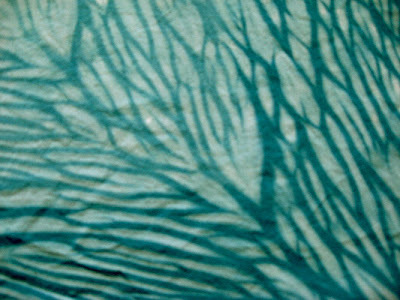 There'll be several loads this week, then I'll be up in Eugene at Jan Myers-Newbury's shibori dyeing class at the Eugene Textile Center. Can't wait for that. And after returning home on April 1, I hope to have most of everything moved by the following weekend. I'm lining up friends with trucks now. But if the weather threatens rain, I'll rent a truck for a day. Enough with the photos already! Many thanks to all of you who commented on the two photos I uploaded this week, and my sincere appreciation that you all like me better the way I am now! I never meant to convey that I wish I still were that younger person, only that I really liked how I looked in the 1984 photo. I'm far happier today than I was back then, and I wouldn't want to go back there for anything. Largely because life has just started to get really good! So, here's my weekly quilt, above, and the collage that inspired it, below. 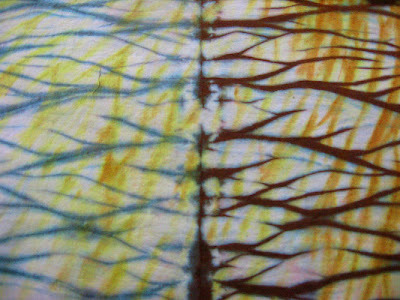 "Rites of Spring" ~ 12/52.2009 is made entirely with handpainted or printed fabrics. 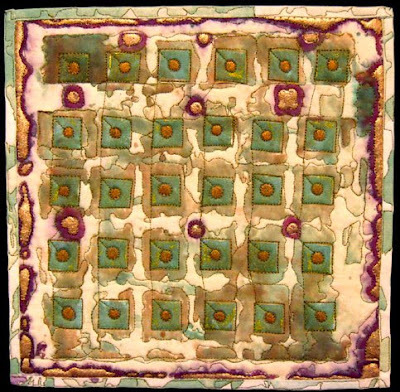 There's a freshness and immediacy to this piece that I particularly like. It says Spring to me, fairly jumping off the design wall to be admired. The collage began with a "waste" sheet of paper that I printed spirals on after having printed a few on another collage. 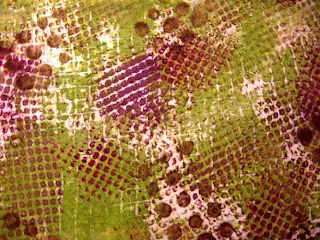 So here you have cleaning paint off the stamp, liking that and making more impressions on a sheet of paper, using the paper in a collage, being inspired to create a quilt based on the collage, and stamping fabric for the quilt. I love how one thing spawns the next. So organic. 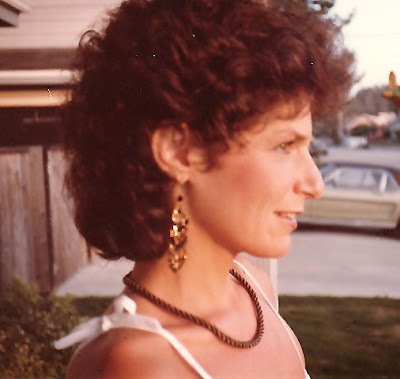 This is the photo I wish I could have posted yesterday -- me in 1984 with the best haircut of my life. I've thought of maybe using this one as my avatar -- but it always bugs me when folks post a photo of themselves from eons ago to make you think that's what they look like now. And when you meet them or see more recent images of them, your jaw hits the floor. Truth in advertising, puh-leeze. Back story on this photo ~ I was just back from Bali, at my thinnest, living in Santa Cruz with my soon-to-be-former husband number two. When I look in the mirror now, I think I'm still half-expecting to see this younger woman staring back at me. Like I said, In My Dreams! Will somebody please tell me where to find the Photoshop filter for "remove age & wrinkles"? It's so strange that I look different to my eye in a photo than I do when I look in the mirror. I guess it's true what they've always said, that "the camera doesn't lie!" Well, this is the face of 60 in 2009. I figured this out yesterday, how to take good photos of yourself with a digital camera. So for those of you who haven't figured it out yet ~ stand in front of a mirror with the camera lens pointing at yourself. You can see the image in the LCD in the mirror. So just move the camera slightly to get the shot you want. This way, the camera's not in the photo! That's all I have to say at the moment! 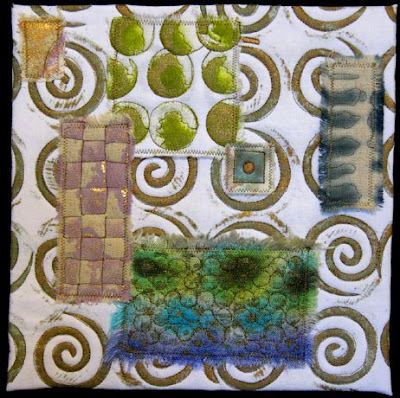 In the absence of my completing textile projects on a more regular basis, I decided I would photograph and post collage journal pages, mostly, for a while. They may as well be textiles, I could just as easily do some of this stuff on fabric. 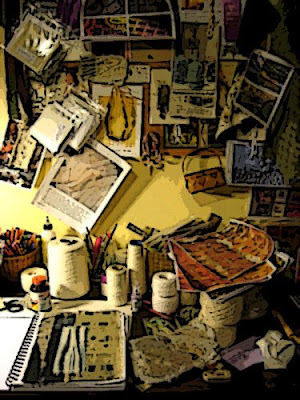 But I do like working with paper images, the immediacy of it, being that I merely have to fish around in my stash of images and clippings and arrange them to my momentary liking. The piece above is an homage to cactus, which I truly love. 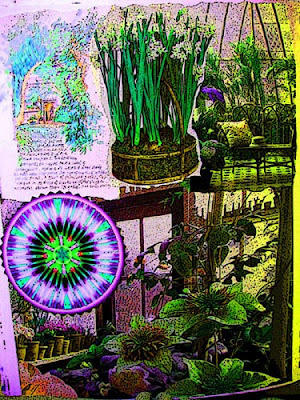 Although there are really only two images of cactus -- the couple dancing at the bottom, which was a greeting card I purchased years ago, and the photo at the top, which I took back in 1989 of the cactus at the botanical garden at U.C. Berkeley. I was studying horticulture and landscape at the time, at Cabrillo College in Aptos, and did a photo study of plants in situ at the Cal botanical garden as well as the Strybing Arboretum in Golden Gate Park, San Francisco. 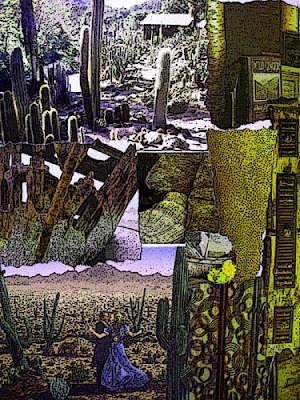 The remaining images in the collage evoke the textural qualities of cactus. I had my hair cut yesterday, for the fourth time since I finally got tired of letting it grow out, which was only about six weeks ago. Now it's short again, but not too, and this cut rivals the formerly best cut I ever had in my life, which for eons appeared to be impossible to reproduce, though I tried over countless years with countless hair stylists. So I am definitely a Happy Camper today. My hair has always been difficult, and it's worse now in some ways than it's ever been. Aging and hormones. Anyway, I've always been really attached to my hair, in terms of having far too many bad hair days when it wasn't behaving. Which was often. Which is why I'd let it grow long now and then. Because I just didn't want to have to deal with it. But then that got to be way too much to deal with. So off it came. In stages. And now it's exactly where I want it to be, and I'm giving myself the gift of wearing my hair the way it looks best on me and the way I like it best, even if it means having to have it cut every 4 to 6 weeks. I wonder when the last time was that February 13 and then March 13 occurred on a Friday...if anybody out there knows, please educate me. If the year was a Leap Year, then the equation wouldn't apply. Anyway, just my internal ramblings this morning on interesting alignments in time. The first image is a photo of a recent morning journal page of mine. 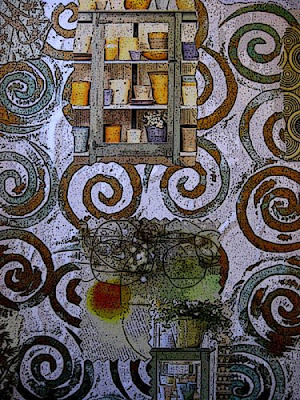 I just loved this one, especially the mandala by Sue O'Kieffe, which totally brings the collage to life. The second photo I took a while ago and it's been sitting in my upload folder ~ a still life, as it were, one of my work tables in my soon-to-be-former studio. Both the images were tweaked in Photoshop. Besides tinkering with Hue and Saturation, my favorite filters are Grain, Watercolor and Poster Edges. There's also Posterize, which is slightly different from Poster Edges but also gives some great effects. If you read my image blog, Textural Images, you know that I love pushing the envelope with all these effects, often turning the original image into something completely different. Or something that could carry its own weight in another application ~ like inspiration for a quilt, or a weaving draft if you've got a Jacquard loom (Alice, are you reading this? ), or spawning another digital image to print to fabric for one or another eventual use. Have a good day, and do something creative! 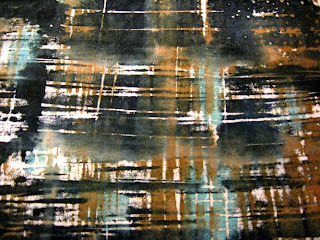 This week's quilt, produced from start to finish yesterday -- #11/52.2009 ~ "Aquarelle." 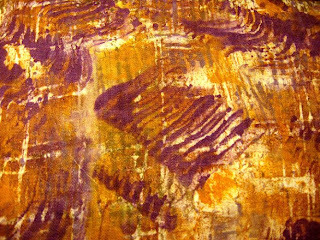 This was one of my very first pieces of hand painted fabric and I can't really remember what all I did with it. 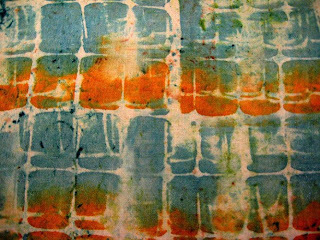 I think I might have made a gelatin print or otherwise printed with fiber reactive dyes that were too weak (this was my first try with fiber reactives), so I stamped and overpainted it with textile paint. And I think I might have added too much water to the paint, which caused the bleeding around the squares. But I really like the watercolor effect -- hence the name Aquarelle. And I'd always imagined it as a little quilt, so here it is! I've been up since well before the crack of dawn this morning. One of those nights where I didn't sleep past about 2:30. I had a lot of energy, so I read for a while, then turned out the light and tossed and turned for a bit, then got up at 4:45! I can always nap later. I do like getting up and going when my body wants to. 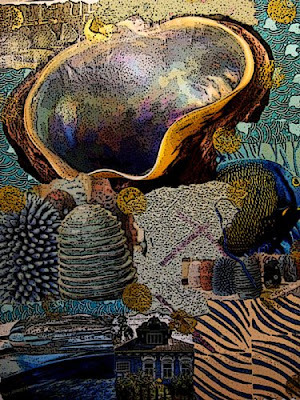 In the hour and a half that I've been up, I've packed a few things, ironed a sheet of fabric that I soaked in Bubble Jet Set last night for quilt labels, printed, cut and sewed on said label, and got materials together for a small quilt show in Ventura County that I'm entering. 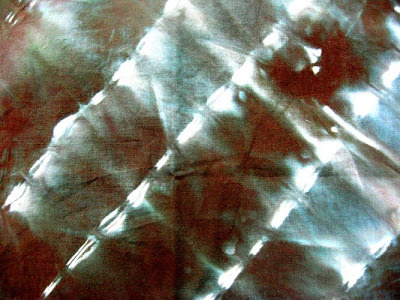 Oh yeah, I also finished gathering up a huge handwoven piece for shibori, and I plan to dye it today! This would be an ideal time to be at the beach ~ the weather has been cool and clear, and I imagine all that lovely late-winter flotsam just begging to be collected. This is not a good time for me to be collecting more stuff, though -- I've been getting rid of as much as I can to facilitate a major move within the next couple of weeks. I'll have to put off collecting more beach stuff until sometime this spring. But I did finish my art quilt group project yesterday, and that's it, above. 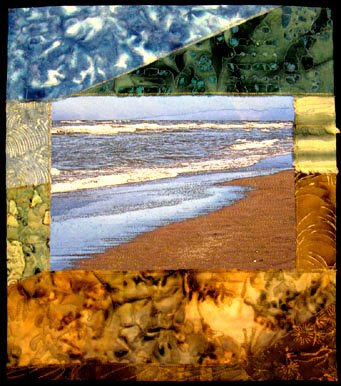 Entitled Samoa Beach ~ Humboldt County, it is 16 x 14" and combines handpainted or screened fabric with commercial batiks. The backing is a piece of deconstructed screened cotton. 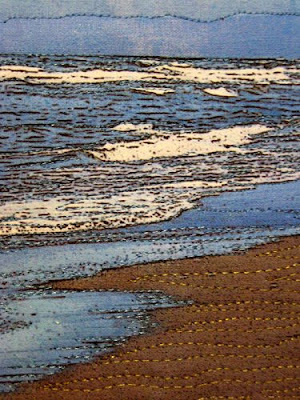 The photo of the ocean, closeup below, was printed on linen pre-treated with Golden Digital Ground Matte. 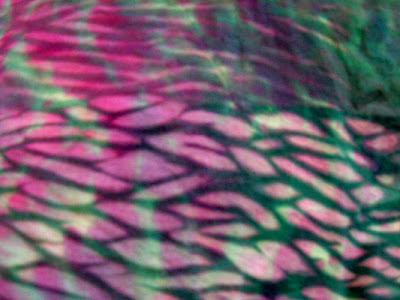 I loved the color saturation with the digital ground, but do not like how stiff the fabric is. Next time I use this stuff with fabric, I'll likely only paint one coat instead of the recommended two. And I might thin it a bit with water, which Golden recommends NOT doing. But then again, I'm using it on fabric, not paper or canvas for which it was intended. I'm working today on this week's 10 x 10" quilt and I hope to have it ready to post by tomorrow. I have two pieces of art cloth near completion, but I've been dragging my feet on them -- too distracted with the upcoming move. I'm slowly packing stuff up, makes it easier to deal with by taking it in little chunks instead of completely tearing the house apart in one fell swoop. Doing it in little bits also facilitates organizing stuff as I go. If I sound perpetually upbeat about this move (read: transformation), know I've been keeping the less-comfortable emotional aspects of my change off this blog, and putting that stuff on my personal blog. If you have any interest in reading my lamentations about it, go there. My dear sweet friend Irene, from The Netherlands, sent me this blog award about 10 days ago. I forgot all about it until I just now was organizing photos on my computer. 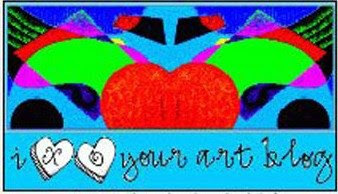 Thank You, Irene for being a loyal reader and supporter of my art and my life. Thanks again, Irene. Have a good day, all! 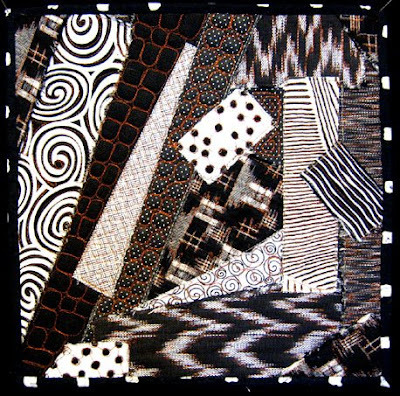 This week's little quilt ~ 10/52.2009 Black & White Thinking ~ is a good metaphor to remind me that most of life happens in the gray area between black and white. It isn't either/or, it's somewhere in between. The new studio is basically two rooms, one of which has a brand new kitchen along one wall. That'll be my living area and house one table for dyeing, etc. Maybe that'll have to be the 5' table instead of the 6' one. I'll just have to get stuff in there and see what will work. I know I'll be lopping a foot off the big studio table, and that will go in the second room. I really don't need all that length like I thought I would. And I think I'll use the 4' table to sew on. The remaining table, along with a lot of other stuff including my loom, will go in storage. 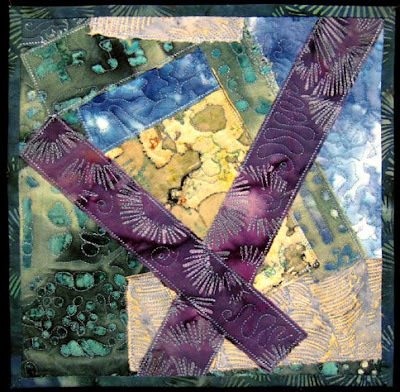 My art quilt group met Monday night and we showed our Humboldt County-oriented pieces. Here I was chastising myself beforehand because I hadn't completed my ocean/beach piece (it's basted and ready to quilt), and I was way ahead of everyone else. I'm always out in front, it seems, and I'm saying this not to gloat in any way, but because it is perhaps evidence of my tendency to move too quickly through life. To want the answers in life to come before I've fully lived into the questions. And mostly what's in front of me right now is questions. So I may as well just slow down and be with them. No photos to post right now, although work is progressing slowly on a couple quilting projects, in between cleaning and organizing. Mostly I've been scouring my house for more and more stuff to let go of, and taking stock of what's left, gathering bits and pieces of like things from scattered locations. It really is a blessing to be able to move at a rather leisurely pace, unlike all of the other moves I've made in my life. In fact, I haven't started packing yet although I've been moving small stuff around. Some of my rooms have echoes already, much less there to absorb sound. Hopefully I'll have a more fleshed-out post in the next day or so. Ciao!